Sunderland Museum and Winter Gardens is one of 12 United Kingdom venues simultaneously exhibiting Leonardo da Vinci: A Life in Drawing until 6 May 2019. Each of the venues selected by the Royal Collection Trust is showing 12 works by the Renaissance genius who painted the Mona Lisa and The Last Supper. Disclosure: This post has been sponsored by Sunderland Culture, which has not reviewed or approved this article. Leonardo da Vinci: A Life in Drawing commemorates 500 years since the artist’s death at Amboise, in France, during 1519. A timeline about the life of Leonardo da Vinci. “We’ve chosen Sunderland, as well as the 11 regional venues, because we are trying to hit the major metropolitan areas in the UK. We’ve tried to make sure we reach the maximum amount of people,” said Hannah Belcher, the Royal Collection Trust’s Senior Exhibitions Project Co-ordinator. “We estimate that once the exhibition has been in London, at the Queen’s Gallery Buckingham Palace, and Edinburgh, at the Palace of Holyroodhouse, that we will have hopefully made it that 34 million people — that’s about just over half the UK population — will be within an hour’s journey of one of these exhibitions. So they were very strategically placed,” added Ms Belcher about the exhibition, which features 144 of Da Vinci’s drawings. “You don’t want to give anyone the best and most famous pieces. The curator Martin Clayton, our head of prints and drawings, selected each selection of 12 works very carefully. What you should have is a cross-section of Leonardo’s main interests, techniques and everything else,” she added as I talked with her in the first floor gallery of Sunderland Museum. Viewing ‘Leonardo da Vinci: A Life in Drawing’ at Sunderland Museum and Winter Gardens. “So here you’ve got him as a botanist, as an anatomist, as an artist, a painter and a sculptor. You’ve got his designs for a villa, which is architectural. You’ve got his military theory interest over there. You’ve got him working in chalk, in pen and in metal point. Every venue has that kind of cross-section so they can see the most of Leonardo,” said Ms Belcher. Preparing the exhibition involved two years of intensive work. Inevitably, that’s allowed Ms Belcher to learn a lot about the life of the artist, who was born the illegitimate son of a notary and a peasant woman in 1452 at the Tuscan village of Vinci. Leonardo grew up with his grandfather and showed a talent for art. It’s interesting to reflect that if he’d born legitimately Leonardo may well have been encouraged to following his father’s profession — thus becoming a notary — rather than allowed to become an apprentice in the Florence workshop of Andrea del Verrochio, a painter, sculptor, goldsmith and draughtsman. Though he’s now known primarily as an artist, Da Vinci’s notebooks hold designs for armoured cars, bridges and flying machines. So what aspect of Da Vinci’s life most surprised the co-ordinator of this exhibition? “I think probably to do with his anatomy and scientific discovery. If he’d printed his treatise he would probably be known as the greatest Renaissance anatomist. He discovered things that weren’t proven until the 1980s, which is extraordinary for the time and the conditions he was working in,” answered Ms Belcher. The works exhibited in Sunderland include a detailed study of lungs, probably of a pig. A study of a bladder and lower leg and foot of a human are also displayed. So too are studies of optics. 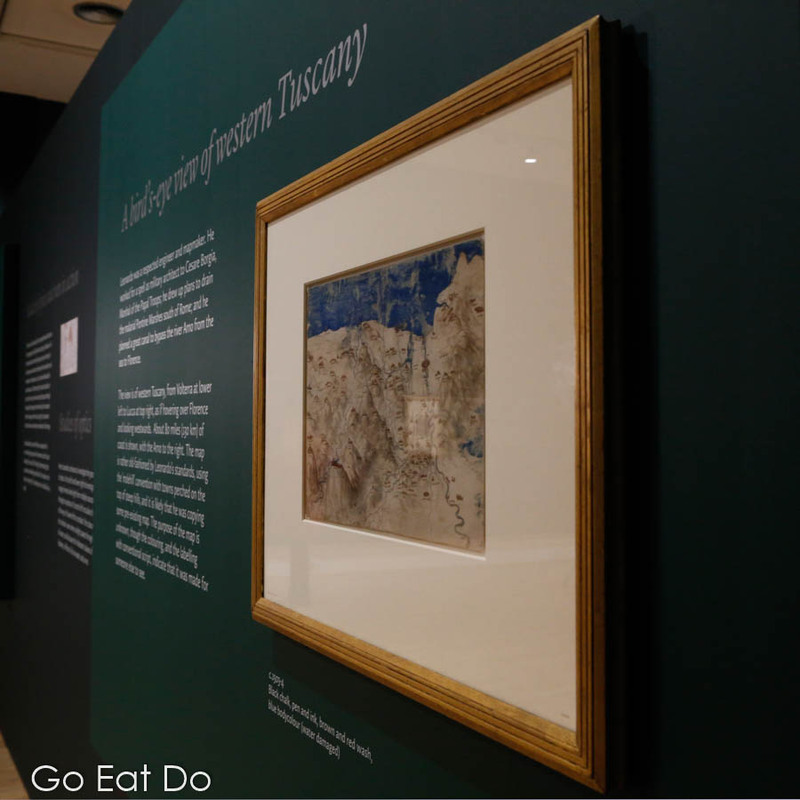 The works displayed also encompass the portrait of a woman, a map of western Tuscany and mortars firing into a fortress. ‘Leonardo da Vinci: A Life in Drawing’ at Sunderland Museum and Winter Gardens. For Sunderland to chosen as one of the 12 venues to exhibit Leonardo da Vinci: A Life in Drawing reflects well on the city. “We’ve been working for the last few years really to put Sunderland back at the heart of the UK in terms of arts and culture. We know it’s an incredibly creative city and we know the people are incredibly creative and what we’ve been able to do with the Tall Ships last year. We were involved with Danny Boyle’s commission Pages of the Sea. We’ve been bringing major national events to Sunderland and really to bring probably the greatest artist in the world, certainly one of the most famous artists in the world, to Sunderland is an amazing step on that journey. So it’s an incredibly proud moment for the city, you know, we’ve been chosen as one of only 12 cities across the UK to be hosting the Leonardo exhibition and we’re very pleased,” said Keith Marrin, the Chief Executive of Sunderland Culture, which manages cultural venues in the city. To coincide with Leonardo da Vinci: A Life in Drawing several of the artworks from Sunderland Museum’s collection are being displayed nearby. Additionally, the neighbouring first floor gallery at Sunderland Museum is hosting What Would Leonardo Make Today? The exhibition opens up a debate about what the Renaissance man would have focused on if he had been alive today. Artworks from the Sunderland Museum collection. Simulaneously, artist Andrew Tift is exhibiting work from his series One Day You’ll Be Older Too. “There was a film that I saw a long time ago, called Fried Green Tomatoes at the Whistle Stop Cafe, which was a film that I really liked. It’s not it’s not a classic film or anything, but he kind of wrung a little tune with me. I thought that’s great: A lady went into the care homes and chatted to people and bought out their memories and stories, and the wisdom and the knowledge of the people and continued their story to the sort into the modern day,” explained the artist. Artist Andrew Tift by his series ‘One Day You’ll Be Older Too’. “So I thought I’d like to go into care homes and make some portraits of the residents there and see them as individuals. I made them quite poignant portraits with kind of humanity to them, which is kind of what I always aim for, and see them very much as individuals,” added the man whose relationship with Sunderland goes back to the mid-1990s. “I did a project through the National Portrait Gallery and BP. I came up and did a series of portraits of the Nissan car workers and old shipbuilders, who I met in the working men’s clubs in Southwick. I did a show of portraits. before tax. I went to the Nissan works in Tokyo and then was it was shown at the National Portrait Gallery,” he explained as we talked in front of his latest pieces. “What I do is I go into the care home and sit down and chat with them. So it’s conversation based to start and then I do quick drawings in charcoal. Just to get used to the face and ease into conversation. Then I start taking photographs. I set up a white screen behind them. And then I take the photographs. Then I’ll go back to my studio, edit the photographs and use a combination of the drawings and the photographs to make these final the final pieces,” added Mr Tift. “The main thing is that I tried to do almost nothing to relate to Da Vinci’s work – you can’t compete. Leonardo da Vinci, as you know, is one of the world’s geniuses, so you almost have to walk away from what he’s done and just do your own thing. I made a conscious effort just to make work that was my work, and not Leonardo’s work. There are occasional little echoes. There’s one of his profile portraits in the exhibition and I’ve done a couple of portraits of a lady to echo that,” he explained. Leonardo da Vinci: A Life in Drawing continues at venues across the United Kingdom until 6 May 2019. See the Sunderland Museum and Winter Gardens website to learn more about Leonardo da Vinci: A Life in Drawing and to book tickets to view the exhibition. Adult tickets are priced at £2.50. Find out about events and exhibitions being held on Wearside via the Sunderland Culture and See It Do It Sunderland websites. After the Leonardo da Vinci: A Life in Drawing exhibition closes, on 6 May 2019, the artworks will be taken to Buckingham Palace, in London, and displayed at The Queen’s Gallery. It will be the biggest exhibition of Da Vinci’s works in more than two generations. Eighty drawings will then be selected for display at The Queen’s Gallery at the Palace of Holyroodhouse in Edinburgh. “A ticket for one for ‘Leonardo da Vinci: A Life in Drawing’ at Sunderland Museum please mate!” A detail from Leonardo da Vinci’s ‘The Last Supper’, which is at the Convent of Santa Maria delle Grazie in Milan, Italy.